This ASCD Study Guide is designed to enhance your understanding and application of the information contained in West Meets East: Best Practices from Expert Teachers in the U.S. and China, an ASCD book written by Leslie Grant, James Stronge, Xianxuan Xu, Patricia Popp, Yaling Sun, and Catherine Little and published in April 2014. Most of the questions contained in this study guide are ones you can think about on your own, but you might consider pairing with a colleague or forming a study group with others who have read (or are reading) West Meets East: Best Practices from Expert Teachers in the U.S. and China. On page 2, the authors reference "a profound disconnect" between the skills employers are currently looking for and the instruction that schools typically provide. What's your thinking about this disconnect? Have you seen evidence of this in your personal or professional experience? What do you feel are the most valuable characteristics of effective teachers? After reading this chapter, have your ideas about teacher effectiveness changed? Compare and contrast typical educational models in China and the United States. In your opinion, what are the strengths and weaknesses of each? How do you think the differences in success attribution (pp. 7–8) have influenced the growth and reform initiatives of each country's educational system? How do you see this enacted in classrooms within your own school or district? Compare and contrast the reform initiatives from each county. What resources do you feel are critical to continued reform in your nation's schools? Since resources are often limited, how would you prioritize them? Figure 1.3 (p. 15) outlines several theoretical frameworks for conceptualizing teachers' effectiveness. Does one seem more logical or intuitive to you? Why or why not? How do these models influence your assessment of teaching practices in your school or district? What do you remember most about your favorite teachers? What about your least favorite? Of the four personal qualities most associated with effective teachers (p. 22), which one is your strongest asset? Which one would you choose to improve upon? How have you used the practical tips for relationship building (Figure 2.1, p. 26) or seen colleagues use these strategies? Are there any you haven't tried and would like to experiment with? Using the six questions on the bottom of page 34 as a guide, write your personal teaching philosophy. Then use what you wrote to reflect on your teaching practices. Reread the key aspects of professional growth and development on page 35. How do you see these aspects of PD at work in your school or district? How might you implement the Lesson Study Cycle (Figure 2.3, p. 40) in your school or district? Would you consider the use of videotaping as a form of self-assessment and professional development? If so, use the questions in Figure 2.4 (p. 44) as a guide to reflect on the process. (Be sure to check your school or district guidelines if you will be taping students in a classroom.) If videotaping is not a possibility, how might you otherwise use Figure 2.4 as a guide for analysis and reflection? Kieran Egan has suggested the following question as a guiding principle for instruction: "Why should it matter to children?" Do you have a similar saying, idea, or philosophy that you use as a guide for lesson planning? What's your feeling about the statement "it is abundantly clear that effective and less effective teachers plan differently" (p. 48)? The authors discuss the importance of planning to ensure meeting both curriculum goals and learner needs. What's your general philosophy of planning? How do you ensure connections among curriculum, teaching, and learners? What do you think about the assertion that U.S. teachers "are more likely to have assessment in mind while planning instruction"? Use the list on page 56 to evaluate your own use of assessment in instructional planning. What can your school or district do to further support effective planning practices, especially for novice teachers? Award-winning teachers are able to recognize patterns in student learning and assess areas of difficulty in order to adjust instruction as it's happening. How do you demonstrate flexibility and adjust to student learning needs in the moment? Is this process facilitated or hampered by the use of detailed, sequential lesson plans? What is your understanding of the mental planning models? How would you explain this to a novice teacher? How could the checklist on pages 64–65 be used to strengthen the planning process for all teachers? Would you change or adapt the checklist in any way? Look at Figure 3.4 (p. 66). Are there ways that Chinese and U.S. teachers might learn from each other in planning structure? How might the disparate beliefs about lesson planning be indicative of cultural and historical differences? What are your thoughts about collaborative versus autonomous planning? Are there aspects of one or the other that you'd like to incorporate in your planning practice? What do you think about the key themes listed on page 78? Would you add, delete, or change any items? If you use the list as a tool for reflecting on your own teaching, where are you strongest? Figure 4.2 (p. 84) shows that higher cognitive levels are featured less in classroom activities. How could you combine this information with the lesson tool on the following page to improve your questioning practice? How do you see students in your school or district demonstrating engagement with lesson content? What behaviors do you specifically look for to indicate that a student is fully engaged? How could you continue to promote and encourage those behaviors? Use the questions on pages 98–99 to guide your reflection or a conversation about instructional flexibility and decision making. How have your own skills in "reading" your class helped you modify activities or content during a lesson? How would you assist a novice teacher in developing those skills? Which learners concern you most: advanced learners, struggling learners, or those "in the middle"? Using the practical tips on pages 104–105, think about how you can craft preassessment strategies in order to adjust instruction and differentiate for learners' needs? How do you see those strategies already being used in your school or district? How do you see teachers in your school or district creating inviting environments? What techniques have you used to encourage a safe, relaxed learning environment? If you are (or when you were) a novice teacher, how would you prioritize the lessons in this chapter in order to begin to master their inclusion in your daily teaching practice? What are some of the most salient aspects of climate and culture where you teach? How about the more subtle, covert aspects? Are there some you'd like to change? How do the environmental differences between Chinese and U.S. classrooms enhance or detract from the development of a favorable climate and culture? How do you see teachers systematically teaching procedures in their classrooms? Do you feel like it makes a difference in the class climate or culture? What techniques have you used (or seen other teachers use) for the purpose of monitoring and maintaining high levels of engagement with all students? How do you balance highly engaged (and engaging) students who demand much attention with those who are happy to "fly under the radar"? What techniques have you used (or seen other teachers use) to create and maintain respectful relationships with students? How do you see those relationships impacting climate and learning in the classroom? How do you create and maintain respectful relationships with coworkers? What are your feelings about praise? What advice would you give novice teachers regarding the use of praise? How might education change if school leaders abandoned the term classroom management and replaced it with relationship building? Do you think student achievement would increase or decrease? Why? When was the last time you had the opportunity to watch great teaching in action? How did it change your own teaching practice? How might we encourage this technique as a formal part of training for novice teachers? In what ways could your school or district make it easier for teachers to work together to improve teaching practices? How do cultural values impact the practice of teaching in your country? What conclusions can you draw from Figures 6.2 and 6.3 (pp. 151–152)? What metaphor do you believe about teaching? If you don't currently subscribe to a particular metaphor for teaching, take some time to reflect on those provided throughout this chapter, and then write one of your own. How will your metaphor shape and guide your teaching decisions? Compare and contrast the metaphors provided by both U.S and Chinese teachers. How do you relate these metaphors to the cultural similarities and differences between the two countries? What essential learning will you take away from West Meets East that will elevate and illuminate your daily teaching and leadership practices? 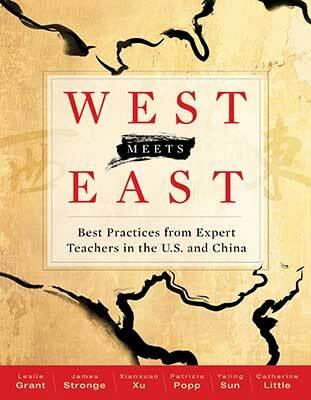 West Meets East: Best Practices from Expert Teachers in the U.S. and China was written by Leslie Grant, James Stronge, Xianxuan Xu, Patricia Popp, Yaling Sun, and Catherine Little. This 180-page, 7" x 9" book (Stock #111012; ISBN-13: 978-1-4166-1820-1) is available from ASCD for $19.95 (ASCD member) or $26.95 (nonmember). Copyright © 2014 by ASCD. To order a copy, call ASCD at 1-800-933-2723 (in Virginia 1-703-578-9600) and press 2 for the Service Center. Or buy the book from ASCD's Online Store.